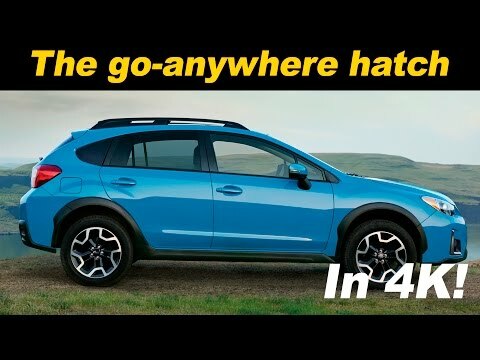 The 2017 Subaru Crosstrek is a compact SUV version of the Impreza hatchback. It offers more ground clearance, more rugged exterior appeal, and true off-road ability. This mini-Outback offers good fuel economy as well, good enough that the Crosstrek Hybrid has been dropped from the lineup. Throw in cutting-edge technology to make the Crosstrek a compelling subcompact SUV alternative. Safest, most comfortable and most fun! I have had my Subaru for a little over a year now and have put plenty of miles on it already. I still love it. It is zippy, it is spacious for a small SUV, and it is comfortable. It does not go 0 to 100 in a blink, but it accelerates well and handles itself wonderfully over bumps and dips. It sticks to the road and the best feature I spent the extra dollar on was the eye sight program. That thing has literally saved my life with today's crazy drivers so many times! Speaking of, there are practically no blind spots which is amazing compared to the last two fords I had! I love all of the extra features, but I think the tech could be better. It can be slow and sometimes sticks and I have had to reset it in the past. The heating and cooling is perfect. The gas mileage wasn't what was pitched to me, but it is really good, especially in town. Long distance travels and short commutes in town to work are very comfortable and I still love jamming out to my favorite tunes on the way. The sound is good and I like that I am not blowing my speakers for the volume to be good. It is spacious and I was a little nervous because while it looks smaller from the outside, everyone I have had in my car even at full capacity has commented on how roomy it is. The truck is deceptively large and I have already done a major move with it packed every inch with stuff on the roof as well. It handled like a champ. All in all, it is been the best vehicle I have ever owned. I am always talking up Subaru and they will continue to have my business in the future. Oh! Almost forgot, the customer service when getting my vehicle serviced through Subaru.. Amazing.. At multiple locations now. Couldn't ask for a better company to work with. It is perfect for outdoor adventures. I decided on the Subaru crosstrek after extensive research and I have been so happy with the vehicle. It is fun to drive on the winding mountain roads of my hometown, and it performs beautifully in snowy conditions. Crosstreks and Subaru makes in general hold their value well, so I feel confident about opportunities to trade in or sell pre-owned. The car is beautiful inside and out. The compact size is great for parking and mileage, and it is comfortable for me, my husband and our dog. It might not be spacious enough for parents with multiple car seats, but otherwise it is a great family vehicle. The new orange and khaki exteriors are stunning! Technology and safety - 5 stars! Gas is great, I get at least 350 miles to the tank. Safety features (lane departure warning, forward collision detection, air bags) in the limited are great, not to mention Starlin that offers roadside assistance and vehicle collision notification which alerts Starlin about an accident and if your airbags deploy, they will ask if you are okay and if you’d like paramedics and if you do not reply, they automatically send to your location. If you are not into larger SUVs, this crossover is great as I have always had sedans and I find no major difference. It is small but also very roomy. 2016 / 2017 Subaru Crosstrek Detailed Review and Road Test - In 4K UHD!